Representing the act, JYP Entertainment said Thursday that the rookie band would release the album on Oct. 22. This comes after “I Am Not” in March and “I Am Who” in August. A teaser image for the upcoming album featured the nine members against the soft purple-tinged backdrop of a rooftop. 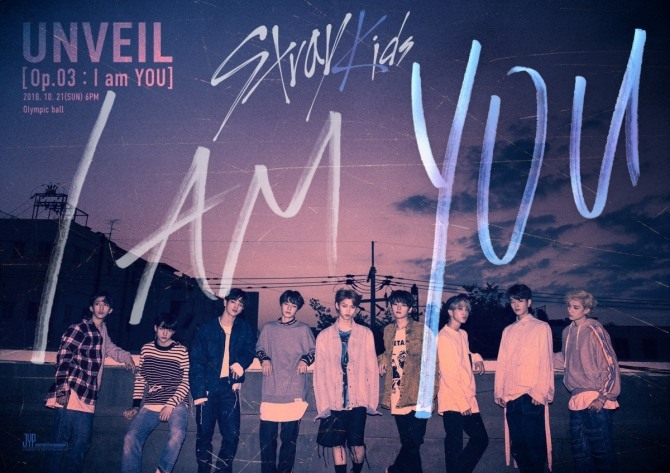 The group will also hold a showcase titled “UNVEIL [Op.03 : I am YOU]” on Oct. 21, a day before the album release, at Olympic Hall in Seoul. Stray Kids will showcase their new songs, in which they participated in songwriting and composing, at the event. Boasting not only vocal talent, but also skills in song writing and producing, Stray Kids garnered attention even before their debut, as they were JYP’s first boy band in four years. Tickets for the showcase event will be available on Oct. 11 at Interpark Ticket for members of the group’s official fan club. General tickets will be available from Oct. 15.